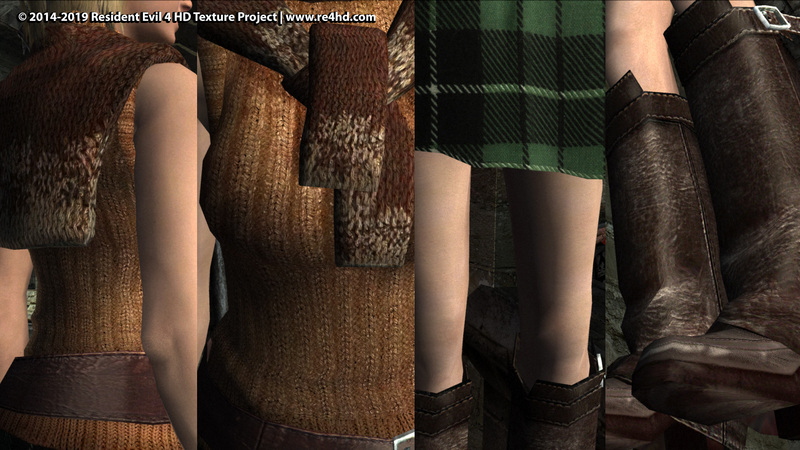 This entry was posted in Progress Updates and tagged chapter 2-1, re4 hd, resident evil 3d model, Resident Evil 4, resident evil 4 hd, resident evil 4 remake, resident evil 4 remaster, resident evil textures. Bookmark the permalink. Excellent. I love the look of the teeth and gums of El Gigante. 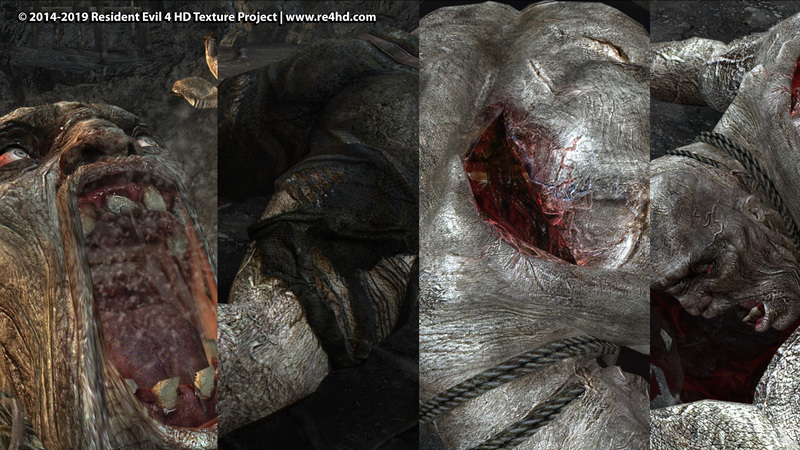 The texture work looks like it’s coming along great. Keep up the good work guys. Your chapter complete screens look too perfect. They’re missing that blur and overexposure lighting that I admit they probably used as a stylistic choice to cover up the up-close low resolution game-cube era textures, but that’s a stylistic choice I think you should try and emulate for that nostalgic feeling and to keep the mod true to its goal of being as close to the original games style as possible. Oh no problem. I’ve been also thinking about this. But the game adds some bloom effects over the image when it’s showed on screen. This is probably what generates that blurry and overexposed look and it also makes the image yellowish. In the original render they looked like… wax or porcelain statues ¿?¿? Their faces were clearly redrawn oven the render and they look terribly soft to my eyes with no reason. It looked like a romantic videogame end of chapter screen XD. And it doesn’t happen in other renders in the game, just a few of them. Yeah they really do look doll like in the original. I noticed that too. They do looks slightly more bended. But taking note, I realize the fingers are not holding onto anything. The hand underneath the pistol is simple to rest the gun into the hand palm for more grip. Well, if you imitate holding a gun with two hands, you’ll notice that your supporting hand (which, as you said, just lets the other hand rest on it) will have the fingers a bit bent (mostly the last two phalanges). In the original render, the fingers look just right, but here, they look a bit off because they are bit extended. Apart from this little detail, the new render blows the original out of the water. 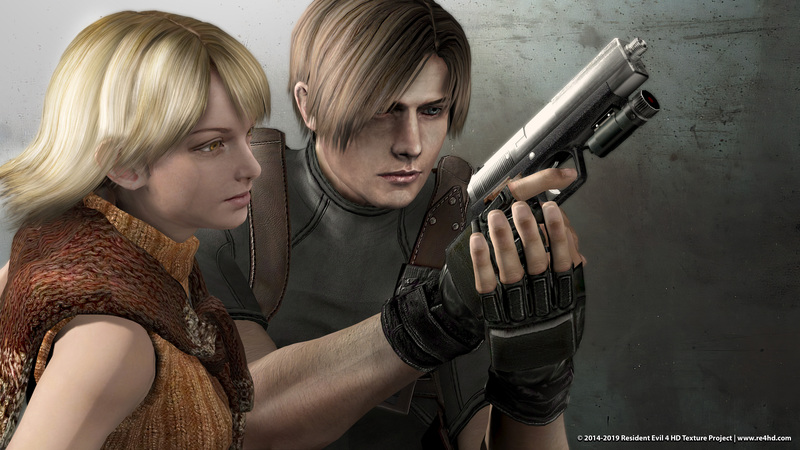 Just a suggestion, but Leon should probably not have his finger on the trigger, as he is a trained professional. I do understand staying true to the original artwork/intention, so I will leave that up to your discretion. It’s not a big deal, just wanted to point that out. Everything is looking great!